I have been working on the pink parasol. I’m almost done. This week I’m hoping to finish it. The paint was getting a bit too wet to work with. I also worked on the leg tattoos. They are more solid now. The end is nearing. Click the image below to watch the YouTube progress video! 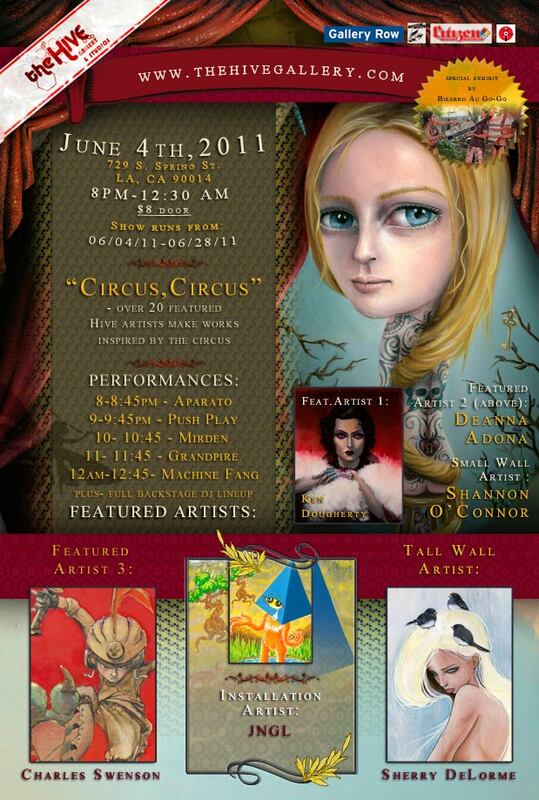 Purple Clown Update and Upcoming Hive “Circus, Circus” June show! This is what I have been up to the past couple of weeks. I have worked on the hair a bit and have almost finished the suspenders. I also straightened the handle on the parasol. Enjoy! Click the image below to watch the progress video. Click on the image for more info on this AMAZING show! The “Blue Clown” will be in this “Circus, Circus” show!! I can’t wait! If interested in purchasing please email me or stop by The Hive this month. This is my piece in the group show currently up at The Hive. I finished this little one tonight. It’s very Easter inspired. The egg shell has an iridescent medium over it to give it some shine. It’s got to compete with those big silver teeth. I’ve been busy working on some new pieces. 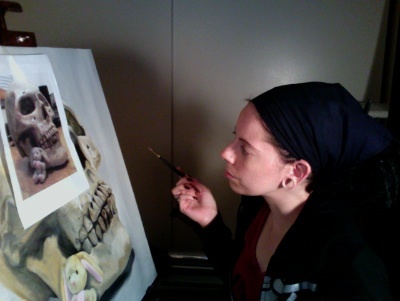 I’m in the process of putting the details in this painting. I’m trying to figure out what to do next.